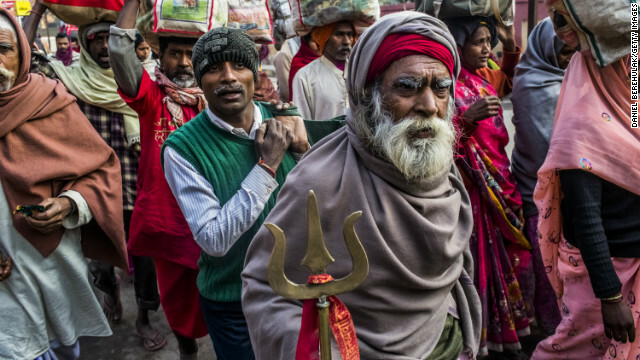 New Delhi (CNN) -- A local Indian official resigned Monday after a chaotic crush at a railroad station a day earlier left 36 people dead among tens of millions of Hindu pilgrims flocking to the banks of the Ganges River for the world's largest religious gathering. In addition to the 36 killed in the ensuing crush, more than 30 people were injured, according to North-Central Railway, which operates the station. Local television footage showed bodies, many of them covered in white sheets, lying on the floor in the railway station, with wailing relatives sitting nearby. Luggage, shoes, slippers and other belongings also lay strewn across the ground. 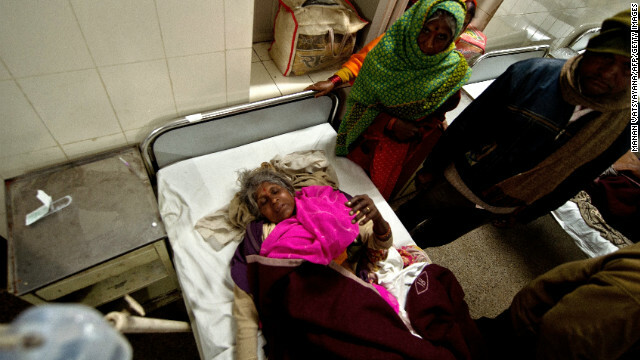 Bittan, 55, lies on a bed at the Railway Hospital in Allahabad after being injured in a stampede at the main railway station. 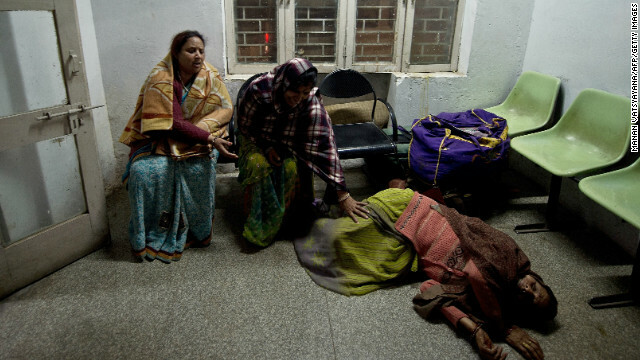 Indian women, caught in a stampede, reacts after not finding their relatives whom they last saw at the sight of the accident at the Railway Hospital in Allahabad on February 10, 2013. 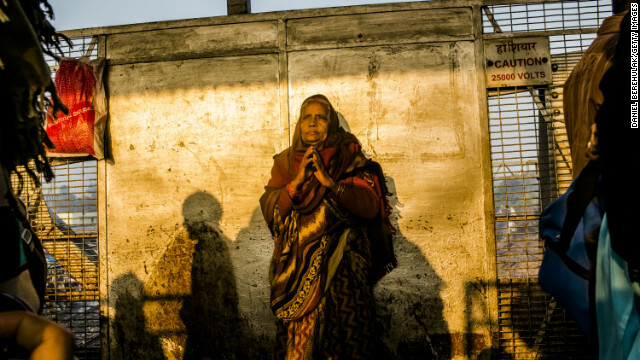 A Hindu devotee clasps her hands together as she waits for her train as people move through Allahabad train station. 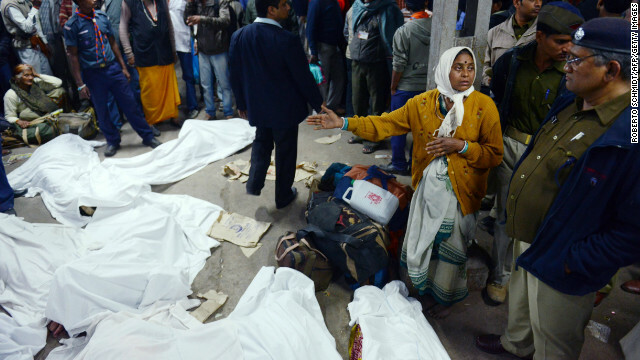 The relative of a traveler that was killed during a stampede at the railway station in Allahabad, India points to the bodies. Rajesh, 45, talks on his mobile phone as he lies on a bed after being injured in a stampede that killed at least 10 people at the main railway station serving India's giant Kumbh Mela festival. Hindu devotees walk towards Allahabad train station as people arrive and depart from the Maha Kumbh Mela. 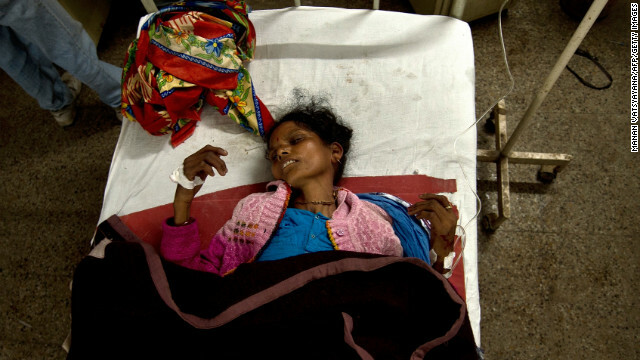 A woman lies on a bed after being injured in a stampede at the main railway station serving India's giant Kumbh Mela festival. 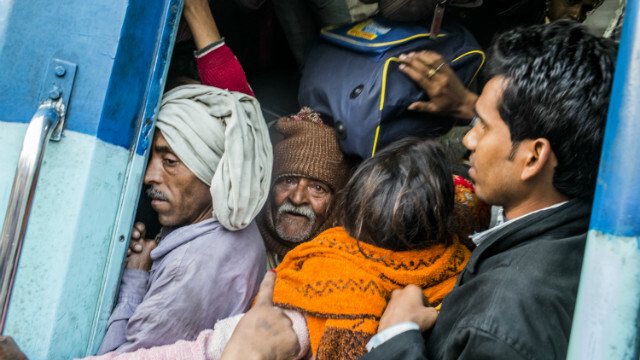 Hindu devotees cram into a train at Allahabad train station during the Maha Kumbh Mela festival on February 11, 2013. 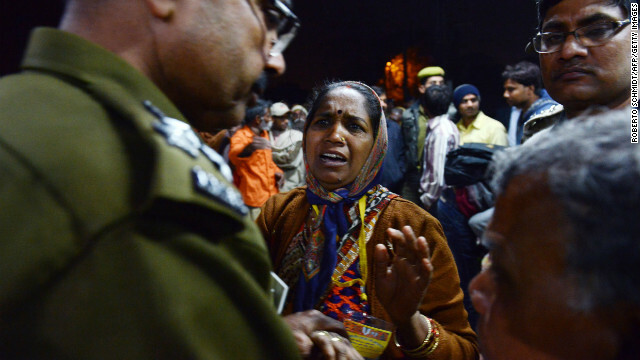 The relative of a traveler that was killed during a stampede at the railway station in Allahabad, talks to policemen on February 10, 2013. Shreya Dhoundial, a reporter for CNN affiliate IBN in Allahabad, said that almost four hours after the stampede occurred, dead bodies remained on the station platform and injured people were still crying for help. "If the media could get in, if police officials could get in, if railway officials could get in, why couldn't the doctors, why couldn't the ambulances?" she said. Relatives of many of the people injured in the chaos gathered at a hospital in the city on Monday, waiting for news on their loved ones, Dhoundial said. Azam Khan, the local official in charge of security for the huge Hindu festival, resigned Monday, IBN reported. Khan, who is also the minister for urban development in Uttar Pradesh, the state where Allahabad is situated, said he was taking responsibility for the fatal disaster. Amid confusion about what exactly had set off the panic, the Uttar Pradesh government ordered an inquiry into a the stampede, IBN said. Some eye witnesses blamed police for the crush, saying they had charged at the heaving crowds in the station. Authorities, however, denied police used force to try to control the mass of people. At one point on Sunday, Sandeep Mathur, a spokesman for North-Central Railway, suggested that the mayhem had been prompted by a person falling from a platform bridge. But on Monday, Railway Minister P.K. Bansal said straightforward overcrowding was the cause. "There was a lot of chaos," he said, adding that the station remained very crowded Monday. Authorities said they would give 500,000 rupees ($9,300) compensation to the families of victims and 100,000 rupees to those who were injured. An estimated 40 million people came to Allahabad, in the northern state of Uttar Pradesh, on Sunday to bathe at the confluence of the Yamuna and Ganges rivers and the mythical Saraswati River. It's the most significant Hindu pilgrimage, occurring every 12 years, Indian cultural and political observer K.G. Suresh said. "The Hindus believe that a dip in the confluence of the Ganges, Yamuna and the Saraswati on this occasion helps get rid of all worldly sins," Suresh said. Sunday was the main day for bathing of the 55-day Kumbh Mela. In Hindu mythology, Allahabad is one of the four places where drops of the "nectar of immortality" contained in a pitcher fell to earth as gods and demons fought for it. The holy bathing began on Saturday afternoon and peaked after midnight, festival official Satish Kumar Sharma said. More than 12,000 police officers were guarding the nearly 20-square-kilometer (7.7-square-mile) site, India's government said. Indian Prime Minister Manmohan Singh said he was "deeply shocked" by the deaths and promised to extend "all possible help" to state authorities. "I send my heartfelt condolences to the members of the bereaved families and wish those injured a speedy recovery," Singh said in a statement issued by his office. He pledged that those injured and the families of those killed would receive compensation. CNN's Aliza Kassim in Atlanta, Georgia, contributed to this report.